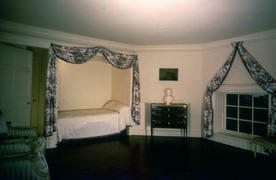 The upper floors of the house were used as bedrooms for Jefferson's family, including his sister, Anna Scott Jefferson Marks. This semi-octagonal room is typical of those on the second floor. It features less-ornate architectural decoration, an alcove for a bed, and a small hearth and flue for a wood stove. Though the placement of the windows at the floor level seems odd from the inside, from the outside, they fit snugly between the top of the first-floor window cornices and the Doric entablature that surrounds the house's exterior. Dimensions 14' - 10" x 15' - 3"; ceiling 8' - 2"
Color Whitewash; potentially replaced with wallpaper in late Jefferson or early Levy period.